The venue sets the tone for your wedding. Centennial Golf Club and Grille offer several choices for your wedding or event venue. 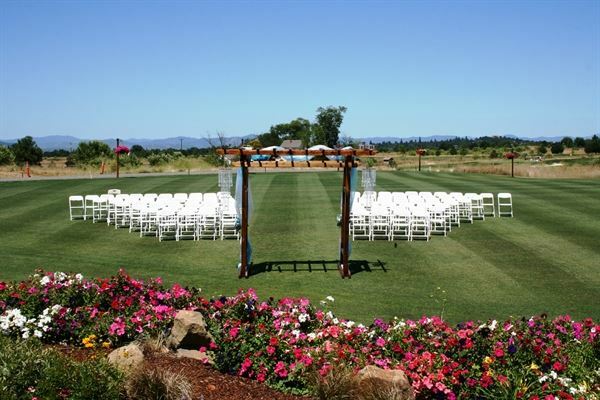 The three venues offer you a panoramic view of the Rogue Valley and the Southern Oregon Mountains. The limitless options allow you to create the event you've envisioned. The venues capture the most breathtaking views of the Siskiyou Mountains, Roxy Anne Peaks and a fantastic 360 views of the Rogue Valley. An 18% service charge per person will be added to the total food and beverage bill. Please contact us for our complete terms & conditions. All options are served with your choice of 2 sides below Potato salad, coleslaw, pasta salad, green salad, Caesar salad, or fruit salad. All prices are per person. Add a beverage station for $1 a person that includes water, iced tea, and lemonade. Add cookies or brownies. ALL AMERICAN - $11 Grilled half pound all beef patty with cheddar cheese, lettuce, tomato, onion, and pickle. Add Hotdogs $1 CLASSIC SPAGHETTI WITH MEAT SAUCE - $12 With marinara, spaghetti pasta, parmesan cheese, and garlic bread. LASAGNA - $12 Layered with ground sausage, mozzarella cheese, ricotta cheese, parmesan cheese, marinara sauce, and served with garlic bread. TACO BAR - $12 With your choice of shredded chicken or ground beef, refried beans, corn or flour tortillas, lettuce, pico de gallo, cheese, and sour cream. COLD SANDWICH BAR - $8 Assorted deli meats with wheat bread and all the fixings. GRILLED CHICKEN BREAST - $12 With your choice of pesto, Picatta, honey mustard, or bbq sauce.